The last major type of cellulose insulation on the market is low-dust variety. 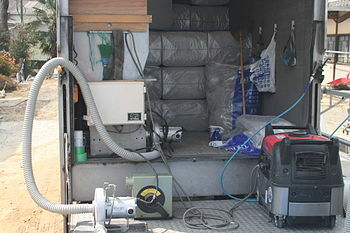 Nuisance levels of dust are created during application of most types of dry insulation causing the need for simple dust masks to be worn during installation. This kind of cellulose has a small percentage of oil or similar dust dampener added. This may also be appropriate to homes where people are sensitive to newsprint or paper dust (though new dust will not be created after installation). 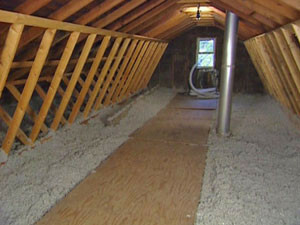 Stabilized cellulose is used most often in attic/roof insulation. It is applied with a very small amount of water to activate a type of adhesive . This reduces settling and decreases the amount of cellulose needed. This can prove advantageous at reducing the overall weight of the product on the ceiling drywall helping prevent possible sag. This application is ideal for sloped roofs and has been approved for 5:12 (41.66%) slopes. The thermal performance of loose filled cellulose compares favorably to other types of low cost insulation, but is lower than that of polyurethane and polyisocyanurate foams. The thermal conductivity of loose-fill cellulose is approximately 40 mW/m·K (an R-value of 3.8 per inch) which is about the same as or slightly better than glass wool or rock wool. This doesn’t represent the whole picture of thermal performance. Other important aspects are how well the building envelope is sealed from air infiltration, convective air flows, and thermal bridging. Cellulose is very good at fitting around items in walls like pipes and wiring, leaving few air pockets that can reduce the overall efficiency of the wall. Dense pack cellulose can seal walls from air infiltration while providing the density to limit convection, when installed properly. The University of Colorado School of Architecture and Planning did a study that compared two seemingly identical test structures, one insulated with cellulose and the other with fiberglass. The cellulose insulation lost 26.4% less heat energy over time compared to the fiberglass insulation. It also was shown to tighten the structure more than 30%. Subsequent real world surveys have cellulose performing 20-30% better at reducing energy used for heating than fiberglass. Compared to closed cell, Polyurethane foam insulation (R=5.5 to 6.5 per inch), cellulose has a lower R-value per inch, but is much less expensive; foam has a higher cost per equivalent R-value. Annual savings from insulating vary widely and depend on several factors, including insulation thickness, original wall performance, local climate, heating/cooling use, air-tightness of other building elements and so on. One installer claims cellulose insulation “can save homeowners 20 to 50 percent on their utility bills”. Insulation reduces sound travelling through walls and between floor levels. Cellulose provides mass and damping. This reduces noise in 2 ways, it reduces the lateral movement of sheet-rock and attenuates the passage of sound along cavities. Cellulose is approximately three times denser than fiberglass, providing a slight improvement in sound reduction. The borates in cellulose insulation provide added control against mold. Installations have shown that even several months of water saturation and improper installation did not result in mold. 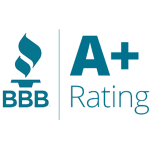 It is a common misconception that the mere presence of crude borates in cellulose insulation provides pest control properties to the product. While boric acid itself does kill self-grooming insects if ingested, it must be presented to an insect in both sufficient concentration and in an ingestible form in order to achieve insect fatality. Proper testing of products containing borates must be performed in order to determine whether dosage and presentation are sufficient to kill insects. Once tested, registration with the EPA as a pesticide is required before a product may be touted as having pesticidal capabilities in the USA. A vapor barrier may not be needed with cellulose insulation. For example, recent studies have shown that air movement is the primary method by which excessive moisture can accumulate in mild marine climate. An insulation that fills the wall cavity completely (such as cellulose or foam) can help prevent moisture problems. Recommendations against using vapor barriers with cellulose insulation are supported by studies, even though they classify cellulose as vapor permeable. In addition, cellulose acts to distribute moisture throughout the cavity, preventing the buildup of moisture in one area and helping to dry the moisture more quickly. Cellulose manufacturers do not recommend the installation of a vapor barrier with cellulose. 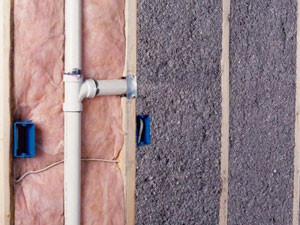 When it comes to insulating their homes, homeowners have many good choices. One option to consider is cellulose insulation, and it passes as a strong contender. Tightly packed cellulose provides a thermally efficient, cost effective and comfortable solution. Cellulose is made of 80% recycled newsprint which is chemically treated to resist fire, insects and mold. It’s no wonder that experts consider cellulose to be safe, “green” and efficient.